The Passionfruit is so-called because it is one of the many species of Passionflower, which is the direct English translation of the Latin genus, Passiflora. The plant was given its name by Spanish Jesuit missionaries in South America, who used it as an expository aid while trying to convert the Indigenous inhabitants to Christianity. The ten petals of the passionflower referred to the ten disciples present at the crucifixion; the thin, curling tendrils were the whips that scourged Christ on the way to the cross and, if you look at the flower closely, you can just about see the crown of thorns. At this point, however, I’ll leave the missionaries to their imaginary friend. In Australia and New Zealand the plant is referred to simply as ‘passionfruit’, and is greatly treasured for its fruit. Passionfruit pulp or sauce is commonly used in desserts, including as a topping for Pavlova and ice cream, in fruit salad, as a flavouring for cheesecake, and in the icing of vanilla slices. 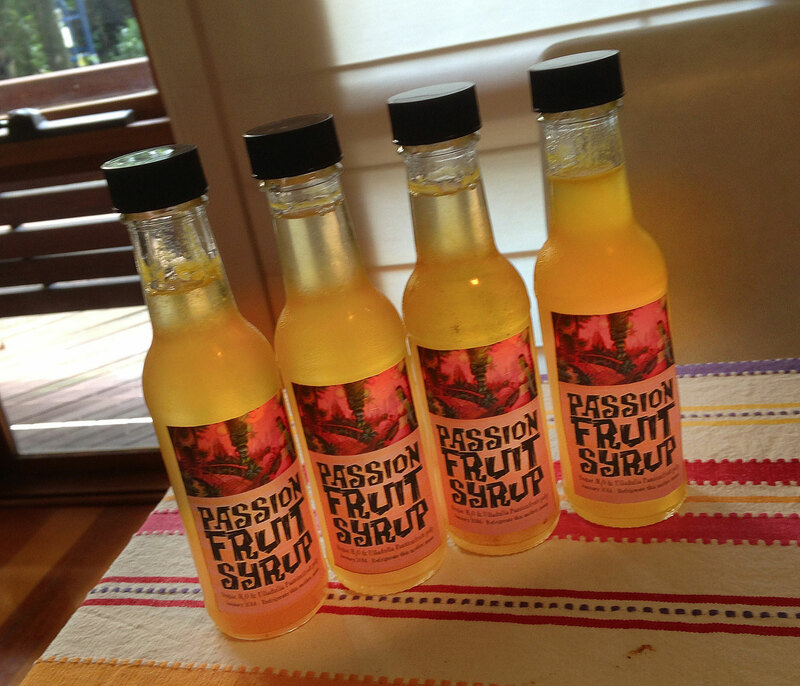 Needless to say, passionfruit holds a special place in the Australian psyche. Passiona – the classic passionfruit-flavoured soft drink – has been around since the 1920s. Backyard dunnies were traditionally covered in a passionfruit vine, which was a very good place to grow them, as they need plenty of fertiliser and moisture. Outdoor dunnies were usually pretty rich in both of these. I rediscovered passionfruit through my love of Tiki Culture, which kicked off my hobby of making Tiki Cocktails. And Passionfruit Syrup is an ingredient in many cocktail recipes. I’ve now planted a vine that I’m carefully nurturing, watching and waiting for it to bear fruit. 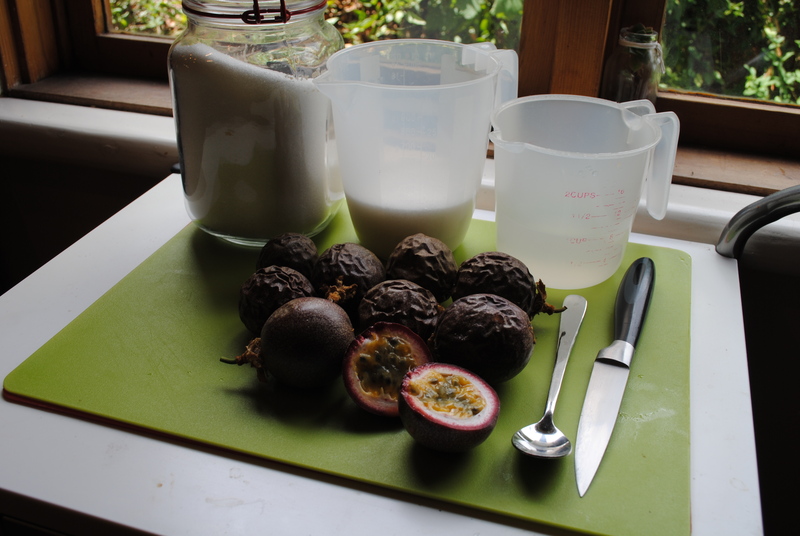 But for those of you who already have passionfruit, or just because you love it, here’s an easy Passionfruit Syrup Recipe. I’ve also included my Hurricane Cocktail Recipe, which makes use of the syrup. Both of the above go down a treat around here. Enjoy! 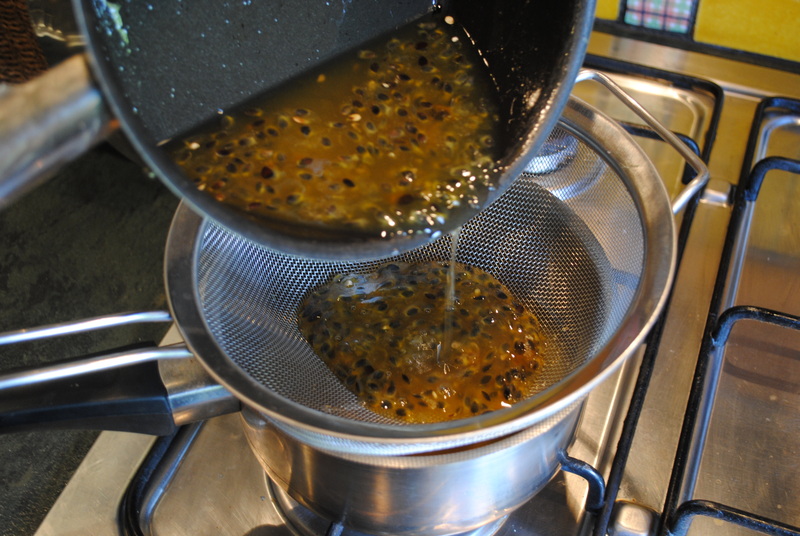 Remove the pan from the heat, add the pulp from the remaining two passionfruit and leave the syrup to cool. The addition of the pulp that hasn’t been boiled adds an extra freshness to the syrup, while the boiled fruit imparts a deeper flavour. When the syrup has cooled, let it stand for about two hours so the flavours really get a chance to come out and settle. Once the syrup has sat for awhile, strain out the seeds and pour the syrup into sterilised bottles. The syrup can be made two or more days ahead but you need to keep it refrigerated. Passionfruit Syrup is delicious on ice cream or in cakes, but it’s especially good when used in a Hurricane Cocktail. As the story goes, during World War II in New Orleans, the owners of the legendary Pat O’Brien’s Bar in the French Quarter – Benson ‘Pat’ O’Brien and Charlie Cantrell – were forced by liquor wholesalers to order as many as 50 cases of rum, along with whatever other spirits they wanted, or else ‘no deal’. At the time there was a post-Prohibition glut of rum and the wholesalers wanted to move it on. So, to get rid of all the rum, Pat O’Brien’s Bar invented The Hurricane. The name came from the fact that the drink is typically served in a glass that looks like a hurricane lamp. *Some recipes include orange juice and Grenadine, which makes them too Daiquiri-like for my taste. To make a Hurricane, put the crushed ice in your cocktail shaker and add the Dark Rum, Passionfruit Syrup and lemon juice. Shake it well. Pour the drink (unstrained) into a cocktail glass – I use my vintage Tiki mugs. You can garnish The Hurricane with an orange slice or a cherry. Editor’s note: I’m lucky enough to live over the road from Ted (Edgar) and I regularly get treated to his Hurricanes. His most recent batch of Passionfruit Syrup was made from our first ripe passionfruit, from the vine we planted just under three years ago. Edgar also plays in a great surf instrumental band – Beware! Black Holes – which you can follow on Facebook. Ted’s passionfruit vine is growing over the walls of his Tiki Hut (AKA the back room), where his band is provided with Hurricanes in Tiki mugs to kick off rehearsal. Ted is nothing if not consistent in his passions. By the way, I chose Midnight Oil’s Power & The Passion to end the post due to the particular Australian flavour to the love affair with the passionfruit, as detailed above.